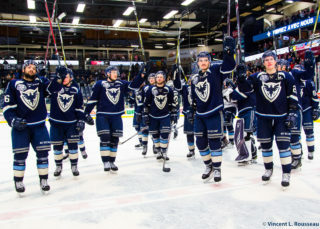 Sherbrooke, Que.– It was a tale of two stories for the Phoenix on this throwback weekend in Sherbrooke. 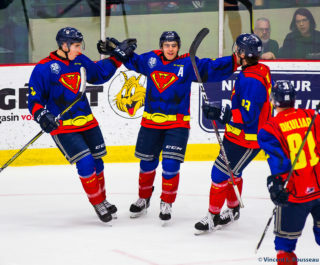 Following a crushing defeat to the Moncton Wildcats to begin the celebration of the Sherbrooke Castors/Faucons alumni, the Birds were able to rebound and knock off the Victoriaville Tigers 5-1 on Sunday afternoon. The Wildcats were in town on Friday night and they got the revenge they were looking for. After getting embarrassed on home ice last week in Moncton, the Cats showed up to play this time around. The visitors netted three goals on the power play, and added another one shorthanded, en route to a 6-3 triumph over the Phoenix. Capanelli, Pelletier, Stewart, McKenna, Seitz and Cyr scored for the Wildcats, while Roy, Guay and Voyer found the back of the net for the Birds. Sporting the Faucons style uniforms on Sunday, the Phoenix came flying out of the gates grabbing an early 3-0 lead. Samuel Poulin opened the scoring 1:22 into the game, igniting the annual teddy bear toss, as fans littered the ice with stuffed animals. Vincent Anctil and Félix Robert added to the lead later in period, giving the Phoenix total control of the game. 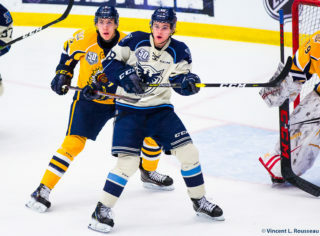 It was Anctil’s first career QMJHL goal, that came with the help of his twin brother Julien, who assisted on the play. “I really liked how we started the game, we came out strong in the first, with a lot of time of possession in the offensive zone. I liked the way we responded after Friday’s game. The second period was a little more difficult, but we rebounded in the third, and despite giving up some chances, I think we had complete control of the game.” said Julien. 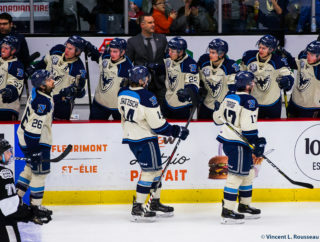 The dominant start brought back memories of the 92-93 Faucons team, that finished first in the regular season before falling to the Laval Titan in the finals of the playoffs. Current head coach, Stéphane Julien, was a part of that squad, racking up 64 points in 69 games. The Phoenix let off the pedal a little in second but were able to preserve their three-goal cushion after the middle frame. Brendan Cregan had little work to do in the first half of Sunday’s game, seeing only four shots through the first 30 minutes of play. In the third, Poulin got the crowd rocking again, scoring his second of the game on a silky saucer pass from Oliver Okuliar. Egor Serdyuk ended Cregan’s shutout bid with 9:10 remaining, as the Tigers finally began to turn things on. Late in the game however, Patrick Guay scored for the eighth time in his last nine games, shutting the door on any possible Tigers comeback and insuring the Phoenix’s 16th win of the season. The Birds outshot the Tigers 33-25. Félix Robert left the game and did not return after taking a high stick to the face in the first period. The Phoenix travel up north to the Abitibi region for two games. They take on the Val D’Or Foreurs (10-15-4) on Wednesday, December 5th and then complete the back-to-back against the Rouyn-Noranda Huskies (23-5-0) on Thursday, December 6th.